Cultivating Concepts: You are invited to a Cookie Linky Party no clean-up required! You are invited to a Cookie Linky Party no clean-up required! Well the Cookie party was a success. Many friends were here, old and new, and lots of yummy cookies and goodies too. My bestest teacher buddy brought her yummy caramel corn (my favorite) and my mom brought her carrot cookies which have been my favorite since I was a child. Lindsay my not anymore student teacher (she graduated yesterday) came for the first time, and so did my last year’s student teacher-this year our third grade teacher, Susan. I think they had great fun, and loved my dip! Barbara’s borrowed recipe from Corner on Character was a yummy hit. I didn’t spend a lot of time on the decorations, oh but were they tasty (sugar cookies are my favorite) I even ate some this morning without frosting. I thought I’d try something new this year too. I made cake balls for the first. I don’t really care for chocolate, so I used a spice cake. I mixed the cake with cream cheese frosting with a dab of cinnamon added, I dipped them in white almond bark, and sprinkled with red sugar sprinkles. Oh my! Can you say rich? One is plenty when you pop these in your mouth. I was a little worried though when I stuck them in my fridge before the frosting went on and I noticed they looked A LOT like the meatballs I had bought! I have friend that comes every year and brings THE best homemade caramels. She was not here. Until I text her and told her I had a mad mob at my house demanding caramels, and they weren’t leaving until they got some. She soon called and said she was on her way! The day was saved! Let me introduce you to the right family. Mr. Right, Mrs. Right, Sammy Right, Susie Right & little Billy Right. Sammy Right has been away in the army and made it home for Christmas. The Right household was decorated with the left over greenery from the tree Mr. Right brought home from Uncle Lefty’s tree lot. Susie Right & Billy Right were so excited because the doorbell rang & there stood Uncle Lefty and Aunt Leftonia. Uncle Lefty was loaded down with just the right gifts for everyone. Aunt Leftonia had baked all the right cookies and pies. Mrs. Right called everyone for dinner. Food was passed to the left and right. Everyone ate heartily & there was not much left. They all settled back to listen to Sammy Right tell tales of his adventures in the army. It brought back memories to Uncle Lefty of marching in the army himself. He could hear his old drill Sergeant Joe Righty calling out “Left, Left, Left, Right, Left.” Mrs. Right woke Uncle Lefty from his daydreams when she called everyone to go to the Right family Christmas tree. Everyone settled around the left side of the tree and Mr. Right handed out all the gifts to the right people. Only one gift was left and when Mr. Right opened it up the message was to Have a Right Merry Christmas!!!!! as she read we passed to the right when we heard right, and to the left when we heard left. It was great fun! I got a 5$ Wal-Mart card Woo Hoo!!! Then it was time for cookies! And oh the cookies, cookies, cookies. I forgot to snap a picture of the FULL table, but here is one of it after everyone filled their trays. The idea is you bring four dozen, you take MORE than four dozen homeJ We also send two trays to a nursing home for the day and night shift, and will take one to the local Hospice office. Your party sounds DELISH!!! Thanks for all of the details; oh, what fun. Cake balls are a real hit down here in TX as of late. I'm glad you liked the cookies - I think it's the easiest dough to work with and it's been a family favorite forever. We frosted an entire batch as a family so that we have plenty to eat and still some to share! So fun! Thanks for this opportunity to link up! Sounds like so much fun, Tammy. I don't need any more recipes, but hope you gather many! Maybe for next year! Have a delicious week, and a very Merry Christmas! Thanks for stopping by my blog and letting me know about your cookie linky party! I went ahead and also linked to the post where I shared my chocolate-dipped turtle recipe with a tutorial! Hope that's ok . . . enJOY. MORE than OK thank you! and yummm! You can can check the caramel corn off of the list of things that you need me to do. It's made and looks quite delicious...just waiting to be eaten... I sure hope if makes it until Saturday night. Love Ya! Happy Snow Day! 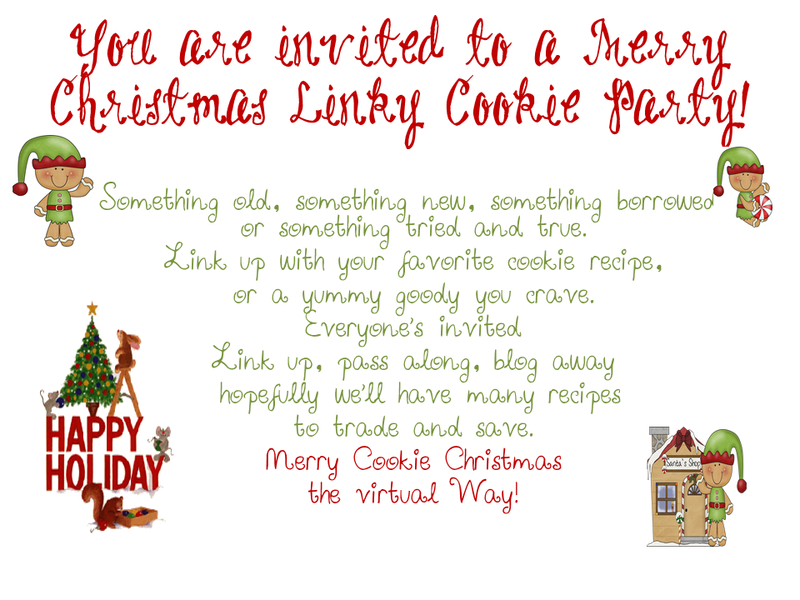 I did link up to your cookie party from my blog, but I wasn't able to post my recipe on your page because it was closed. I did post it on my page, though! I really enjoy your blog, and I'm glad you found mine!